The U.S. has no legitimate claim to intervene in the internal affairs of other countries, to take sides in internal political disputes, or to undermine governments elected by the people. We have seen the disastrous consequences of recent U.S. interventions in Iraq, Afghanistan, Syria, and, through its alliance with Saudi Arabia, in Yemen. 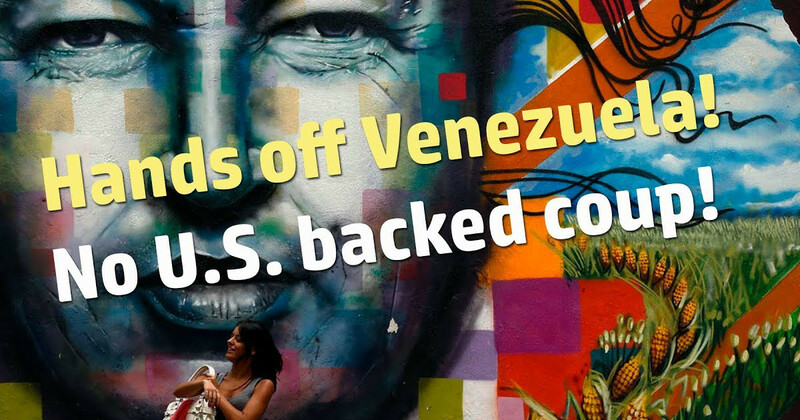 U.S. intervention in Venezuela can only bring further hardship and suffering, as followed U.S. support for the 2009 coup in Honduras that overthrew the elected government there and contributed to the stream of asylum-seekers now on our southern border seeking relief from that disaster. History professor Greg Gandin argues in a recent article in The Nation that support for the coup in Venezuela is aimed at undermining Medicare for All, a Green New Deal to provide jobs, and other policies that working-class Americans desperately need. Trump, himself presiding over a nation suffering a seemingly insurmountable crisis and challenged by a united (or united enough) opposition, is desperate for something to break the deadlock. [ … ] Venezuela beckons. Recently Trump imposed new sanctions on Venezuela and said he would not rule out a “military option.” The U.S. media and politicians have recently been even more overwrought in their denunciations of President Nicolás Maduro’s elected government, ostensibly because it held an election for a constituent assembly. Apparently holding an election without the U.S.’s permission is a sure sign that you are trying to impose a dictatorship.